Prominent & Leading Manufacturer from Bengaluru, we offer aluminum foil tapes and copper foil tapes. Extremely soft Aluminum Foil Tapes with pressure sensitive acrylic adhesive. To improve the strength and adjust the swing weight aluminum foil tapes are laminated to paper or plastic tapes. Foil tapes best known for heat reflection, protection purposes, sealing and general holding. 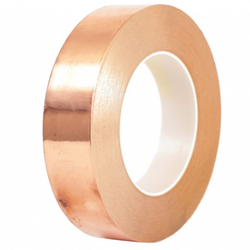 We are offering a wide range of Copper Foil Tapes.